Making Thanksgiving dinner is hard enough for most people. For those who have guests with food allergies, it can be grueling. Mom can't eat the creamy mashed potatoes because she's lactose-intolerant. Aunt Amy skips the bread stuffing because she's gluten-intolerant. Uncle Henry is allergic to nuts, so he can't eat half the dishes on the table. Just order him a pizza. As for dessert, well, it's practically a death trap. Classic Thanksgiving pies typically contain gluten, butter, milk, sugar, and nuts. Plus 1 in 2 Americans is pie-challenged. I know, I'm one of them. 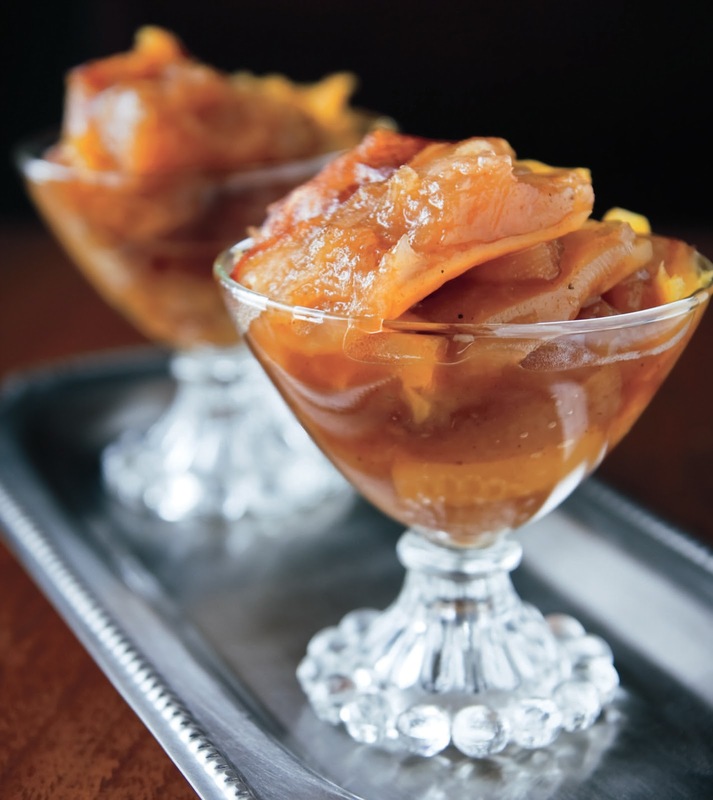 Here's the answer to your Thanksgiving dessert dilemma: Make Nava Atlas's Apple-Pumpkin Delight from her latest cookbook, Vegan Holiday Kitchen (Sterling, November 2011). It's gluten-free, soy-free, and nut-free, so everyone will be able to enjoy it. And you won't have to make a pie crust. A veteran vegetarian and cookbook author, Atlas has created more than 200 festive, tasty, vegan holiday recipes organized into six chapters: Thanksgiving, Christmas and the Holiday Season, Jewish Holidays, Easter, Independence Day and Summer Entertaining, and Brunches, Appetizers, and Potluck Dishes. In her introduction, Atlas says, "Holidays can be particularly trying for vegan who aren't part of a wider circle of like-minded eaters This book is dedicated to them-- and to vegans of all stripes." Of course, be prepared for the carnivores at your table to gobble up many of these meat-free dishes. Who could pass up autumn-inspired Coconut Butternut Squash Soup or Sweet Potato Biscuits? If you think gluten-free stuffing can't be delicious, consider Atlas's herb-laced Polenta, "Sausage," and Mushroom Stuffing or her softly spiced Wild Rice Stuffing with Dried Cranberries. You'll find traditional holiday recipes such as Cranberry-Apple Sauce, Pumpkin Mini Loaves, and Ginger Cookies sharing space with modern dishes such as Red-Wine Roasted Brussels Sprouts, Baked Thanksgiving Risotto, and Mixed Greens with Green Apples, Beets, and Pistachios. The book's design is clean and inviting, and Susan Voison's photos are attractive. While some recipes have longer ingredient lists, most are short, and recipe instructions are clearly written and uncomplicated. As for make-ahead recipes, Atlas notes that "most recipes just don't taste as good when they're made too far ahead of when they'll be used... Honestly, most of the recipes in this book are not so lengthy or complicated that they benefit from advance prep." Sprinkled throughout the book are useful cooking tips, entertaining suggestions, and notes about ingredients. So whether you're looking for vegan holiday inspiration or just some new, healthy recipes, you should get yourself a copy of Nava Atlas's Vegan Holiday Kitchen. 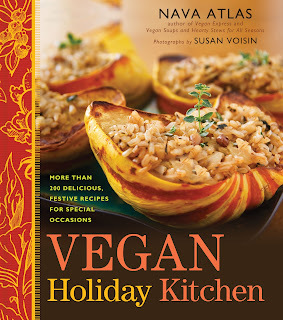 In the comment section below, tell me why you'd like to win a copy of Vegan Holiday Kitchen. Tweet about it and mention @foodblogga, and I'll count that as another entry. I'll announce the winner on Monday, November 21st. 1. To make the pumpkin easier to peel and cut, partially pre-bake it according to the directions on page 22. When cool enough to handle, peel the pumpkin and slice it into thin pieces about 1 X 2 inches (about 1/8 -inch thick; the size matters less than the thickness). Peel the apples and slice a little thicker than the pumpkin. 3. Combine the sugar, cinnamon, nutmeg, cloves, and cornstarch in a small bowl. Oil a 2-quart casserole dish. Arrange half the pumpkin slices in the dish, and sprinkle with about 1/4 of the sugar mixture; arrange half the apple slices over the pumpkin and sprinkle with another 1/4 of the sugar mixture. Repeat the layers. 4. Cover with foil and bake for 30 minutes. Remove the foil and bake for 15 minutes longer, or until a knife inserted in the center goes through easily. Serve warm or at room temperature in individual dessert cups. I'd love to have a copy of this book because during the holidays it is always a challenge to come up with new healthy and delicious menu items that the omnivores and stubborn guests admit they love! I have a few of Nava's cookbooks and all of them are absolutely amazing! I've never eaten anything of hers that I didn't love. I'll be the lone vegetarian at Thanksgiving this year so I'd love to get this for some extra inspiration since I'll be doing a TON of cooking! I would love to own this cookbook. Ever since our first Farmers Market trip with you and Jeff last year we have increasingly (and unintentionally) become more vegetarian, more vegan and more "raw." I have always loved good food, but now I love real food in a whole new way! And I still have a lot to learn about these new ways of preparing what we eat. this book would be so perfect! i love holidays and this year is our first vegan holiday.. it would make life so much simpler to have some tried and tested vegan options! I would truly love to win this cookbook! I am not vegan by any means, but have many friends and friends with kids with serious allergies - sounds like this cookbook has lots of wonderful recipes worth trying! Thanks! Love your blog! This lovely book was given as an example by a literary agent at IFBC this past weekend - of carving out a beautiful niche in the popular vegan cookbook genre. My new husband has been diagnosed with Diabetes and I'm hoping to find some delicious and clever ways to get vegetables down the throat of a sweets and starches loving man. I know first hand, after losing my Mom to Diabetes, what horrible things this disease can do. I'm hoping after waiting so long to meet "Mr. Right", that I'll get to enjoy him for many years to come. I would love to get inspired by this book, I love to enjoy healthy and tasty meals. Hello...thanks for offering us this opportunity for this fab. book! It would make a great addition to my VEGAN cookbook collection...I can't believe how MANY scrumptious VEGAN recipes I am collecting...it is making becoming VEGAN so much fun to see the multitude of foods we can eat! Cheers, Valerie. i`d love to have this book because i love cookbooks and i want to try out vegan recipes for health- and other reasons.thank you for the giveaway! I would love a copy of this book because I am new to the "vegan" way of life - I only have 1 vegan cookbook and I'd love to have another one - the photo on the front of the book looks incredible!! As a vegetarian living in Tennessee it is hard to come by veggie-friendly meals. We are eating Thanksgiving dinner at a friend's house, and while open to meatless meals, Thanksgiving is not likely one of them. I would love to bring a vegan dish or two that I know would WOW them! Gotta' share the vegan love! As a new vegan, the holiday season is going to be challenging for me this year and having some great holiday recipes to share with family and friends would help tremendously. I would love to win this book because 1) Nava Atlas is the author of one of my favorite cookbooks 2) my boyfriend and I are cooking an entire vegan Thanksgiving meal by ourselves and 3) I'm a poor student too broke to buy it for myself! I've been trying to stay vegan, but struggle with recipes my kids will eat. I hadn't yet thought to check out a vegan holiday cookbook, but these would be great. They could help me make them. It's frustrating; they like most of the fruits and veggies taken separately, but mixed together... not so much yet. Can't wait to try the apple-pumpkin shown above! I'd love a copy b/c my grandma is afraid of anything vegan. I need to make something that she cannot resist! baked thanksgiving risotto?? I need this book! :) Sounds amazing! The holidays are tricky as a vegetarian, even a long time one like myself, as we are always looking for the one big tah-dah dish - sounds like this book is full of those! I would love a copy because I'm a vegan in a family of meat eaters, and am always looking for new recipes that both they and I will enjoy. And that pumpkin-apple recipe sounds wonderful! I am beyond excited about this book. I have slowly been moving our family away from meat this year. I am not a meat eater and love to get creative in the kitchen and this looks like just the book I need to go meatless this holiday season! I want us all to take a looooooonnnnnngggg walk after we eat, not fall asleep! I would love a copy of this cookbook! I have been a vegetarian since 1986, and I have been wanting to try to make the change to vegan. My husband and son are carnivores, but do eat a lot of vegetarian meals with me. My 7 year old son loves tofu, and he is very willing to try new things. I would love to do an entire vegan holiday meal that everybody can enjoy. I would love to have a copy of Nava Atlas's new book, Vegan Holiday Kitchen, because I love to cook vegan food and I hear her books are excellent. With the holiday's coming up, it would be great to have some fresh recipes to choose from. I want this cookbook!! I love her recipes I have gotten online and would love to have a collection of holiday recipes. It looks like a new cookbook by a terrific author that would be welcome in anyone's kitchen. My usual vegan feast is getting boring and I need some new ideas. Vegan is fun, and it's books like this that inspire. Thanks. I would love to have this book so I can learn new recipes to entice my family to eat vegan with me! I'd love to win a copy of this book because, of all the cookbooks I have, I don't have one for the holiday's yet and this is the cookbook I am coveting most right now! As a vegetarian of 24 years that has just gone vegan in the last year, I am finding my repertoire of dishes that I would normally do, not fitting the bill this year. Looking forward to a vegan Thanksgiving for hubs and our 2 little life-long vegetarian daughters and would love to expand my holiday go-to recipes. Thanks so much! Blessings! I'd love a copy of Vegan Holiday Kitchen so I can make great recipes to share with family for the holidays. I met Nava at a Vegan food and wine pairing in Gardiner and bought one of her books. She is very friendly and gracious, and her recipes are fabulous! I am always on the lookout for recipes that my kids love! I am on day 3 of being a vegan, and right before the holidays was probably not the best time to make this life change, but it is what it is, and I am LOVING it!!! Now I have to adjust my holiday menus:) Please give this to me, you will be saving me hours of internet searches!!!! I would love this book b/c i would like to start holiday traditions with my family centered around compassionate, healthy cooking! Thanks for the giveaway! I'd love a copy, since even though I've been a vegetarian for 20 yrs, this is my first holiday season being completely vegan and would love to have some recipes to work with! I'd love a copy since reading cookbooks is my favorite hobby, and I like to show relatives that vegan food is very delicious! I've been vegetarian for almost 12 years, and I've recently been slowly inching my way toward becoming vegan. But for the past few years, I've aimed for a cruelty-free Thanksgiving and Christmas. Unfortunately, I just make the same old recipes that I regularly eat! I would love to have a copy of this cookbook to get some new delicious recipes for all holidays and to help me make the switch to being vegan! would love to see the Jewish and Passover section of this cookbook! Been having cravings lately! I would love a copy of this cookbook, with my first round of holidays coming up since my change to vegan eating! I looked through it at B&N and it is LOVELY but I cannot afford to buy it at this time. Love the beauty of it! I host the holiday functions for my (non-vegan) family. I enjoy sharing lovely vegan food to show them how easy and delicious it can be. I am a new vegan (still under one year). I host Thanksgiving every year, and this will be my first one with vegan options (my family is not yet vegan). I could really use help finding great recipes for the holidays. It's not a good time to serve a so-so vegan recipe, and a great time to open people's eyes to the possibilities of a vegan diet! I'd love to win this book because holidays are my favorite time to make special recipes, and everything I've heard about in this book sounds so good! Thanks for the giveaway. I have a few of Nava's cookbooks, and they are definitely among those I use most often! I'd love to add this one for some special holiday recipes! My kids are dairy allergic, and I prefer meat-free meals, so vegan cookbooks are very inspiring. O have a vegan son and am trying hard to make sure he has a feast for the holidays. I'm new at this kind of cooking and need all the help I can get. Thanks! I would love to have this book only because I am new to being a vegan and really need some creative ideas for meals for my family, especially my 6 yr old son who I am having a difficult time turning (hope that changes soon). It can be very intimidating around family so this year the holidays will be spent at home because I am not strong enough or ready to handle the SAD diet of my family. Having something to refer to for meals that I could make for them, during the holidays, in the future would be very helpful. I would love to win this book as I am always on the lookout for yummy vegan recipes, especially around the holidays. I would love to have new recipes to try out, especially some without meat! I'd love to get a copy- I'm always making recipes for my husband and my co-workers and I love to amaze them with AWESOME vegan recipes. I really like that they always anticipate that I am going to bring something new and healthy. The best part is I am always asked to bring in copies of the recipes- yea! Baby I gotta have it! As someone with a severe life threatening milk protein allergy, I am charmed by all the vegan delights I can make. I am not vegan or vegetarian ( I like chicken, fish and occasional grass fed steak), but I love cooking this way. It compliments my other dishes and allows me to not feel like I am missing out on flavor and beautiful meals simply because I can't have milk, butter, cheese. With my dairy and egg allergies it is hard to find good recipes that I can eat during the holidays. Also, my family of dairy loving carnivores think that Vegan food is disgusting. I'd like to be able to change your mind with Nava's amazing recipes. Love you blog! The recipes sound amazing. I'm new to the vegan lifestyle (and also the odd woman out in my family). I'm looking for great tasting vegan recipes that are also healthy (or heathier) this season. They would be nice introductions for the rest of the family too! I'd love a copy because this is my first time going through winter holidays and I would love to try a bunch of tasty vegan holiday foods! I collect cookbooks. And due to my eating preferences for health, I gravitate toward vegan recipes. So this cookbook would be a fantastic addition to my collection and I would get to create/cook some healthy, yummy meals. I don't have any of Nava's cookbooks and I'd love to expand my recipe options! I sooo need this book! I'm cooking Vegan Christmas dinner for 12 people this year and only 5 of us are vegan. I really need to knock the socks off some omnis!!! We are hosting Christmas at our house this year and I'm quite stuck for ideas as to what my meat-eating relatives would enjoy. I don't want to miss out because of being vegan and don't want to have to cook separate meals. This book would be perfect to help me! Pumpkin apple dish is now on my Thanksgiving menu. Susan's blog is amazing and I would love to use Nava's book! I would love to wow everyone at the company's holiday potlucks...won't they be surprised (we aren't!) that vegan desserts taste great! I've been eating vegan for about 6 months now and love it! Would love a vegan holiday cookbook to help me make it through the holidays since many of my former holiday dishes aren't vegan. I want to secretly switch my family's traditional holiday dinner with a vegan feast of epic propotions...and see if they notice the difference! Grandson, currently serving in the Army, will be coming to our place for Thanksgiving. When asked what he would enjoy eating, his response was.."some awesome vegan food". I could really use this cookbook. Thanks for the opportunity to win one. This last couple of years I have been "leaning" into a vegetarian lifestyle due to poor health. So many people I know have immune diseases and allergies. Awareness and knowledge of what we eat and where it comes from is the key. Making a conscious effort to living a cleaner, healthier life. I am constantly inspired by so many fabulous blogs. I would love to win this cookbook. Would love to win this cookbook to continue on my road to being vegan. Love the recipes. Would love to win this wonderful cookbook to improve on my vegan cooking. Love the recipes. I would love to win this book so it can help me show my family and friends that it is possible to make/eat delicious food without meat and its by-products. hyloSince beginning to eat this way just 2 yrs. ago and being convinced that it is a good thing I'm doing for my body and my world, I really would like to be able to continue spreading the word to family and friends by fixing some wonderfully healthy, vegan holiday delicacies. Thank you! I've checked out many other of Nava's cookbooks from the library and have loved them! As a vegan family with 4 small children I'm always searching for recipes that they will like and especially good ones for the holidays to make a tradition of. Wouldn't it be amazing if one of the recipes out of this cookbook could become our new Christmas dinner menu and would be passed down for generations. That's my plan with raising my children with a healthier and more conscious awareness. I would love a copy of the 'Vegan Holiday Kitchen' because I am a brand-new vegan. I am hosting Thanksgiving Dinner and I'm the only vegan that's going to be there! I could desperately use the help. How well I pull off Thanksgiving Dinner could decide whether any of my family and friends convert to the vegan way of life. Please consider me. :) Thanks and Happy Thanksgiving! Would love to have this,my daughter is new to eating the vegan way and my 3 yr.old granddaughter is vegetarian . This will help me a lot for holiday cooking because I don't have a clue when it comes to this type of cooking. And some of the recipes I have read seem to please everybody. I would love a copy of this book because i always stress out looking for great new recipes for the holidays. It would be so nice to just have them all in one place. I just started eating vegan and would love more input on various meals. This book has received such high reviews and sounds like a must for all vegans. Everything I've made from reviews has been awesome! I'd love a copy. I'd love to win it! Please? I have given away 2 books on my blog http://veganfit.blogspot.com. Now it's my turn to win! would love to win a copy of this book, recently went vegan and the hardest thing is to find new recipes that are tasty and vegan! I'd love this book, transitioning to vegan is challenging during the holidays and potlucks. Everyone is watching what I'm bringing and what I'm cooking. I'd love a resource like this that will offer delicious recipes for me and my guests. I've been trying to find recipes to share during the holidays to convert my meat-eating family over from the Dark Side. Nava is a cooking genius, and I'd love to see all the interesting seasonal holiday recipes she's compiled! I'd love some great tools of persuasion to get non-vegans interested and asking for more vegan dishes! My mother-in-law thinks that making me fish every holiday dinner fits in with my Vegan diet...I need to win this book so I can share it with her! I'm having my first vegan Christmas this year & I'm the only one in my family that's vegan. I need Nava's cookbook, so I can show my family that I'm not somehow deprived because I choose not to eat/wear/abuse animals. I would love to see the recipes for all the dishes you named from the book! We have two vegetarians at the family dinner table now, and I can always use more vegan recipe ideas! ooh, that dessert sounds fantastic! I really admire Nava's work and I'm totally into cooking inclusively so that everyone can enjoy the meal together. I'd love to win because I'm newly dairy and gluten-free, and cooking for the holidays has always been a challenge for me anyway. I LOVE that there's a chapter for Jewish holidays--we host all of them, and have vegan friends who can't eat most of the "traditional" foods my husband loves. It would be great to start creating new traditions with food everyone can eat! I confess that I love to read cookbooks the way some people pick up New York Times bestsellers! I always love browsing through healthy cookbooks, and the vegetarian/vegan aspect is a huge bonus. I would LOVE a copy of this cookbook! I would love to have a copy of Vegan Holiday Kitchen to know how to cook for my son. Plus I have been trying to eat more veggies and not as much meat. It would be a pleasure to have some great recipes. Thanks! Congratulations to Brian (BriGuy) who won the copy of Vegan Holiday Kitchen! Many thanks to all of you who commented and tweeted. There will be many more give-aways to come!